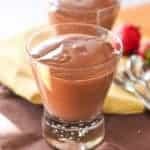 Silky smooth and delicious 5 minute pudding! If you make this once, you will make it a hundred times. Wholesome ingredients that come together in a flash for a real treat! In medium saucepan combine sugar, cocoa, cornstarch and salt with a whisk. Add milk and continue to whisk. Heat to simmer over medium heat. Cook for 1-2 minutes until thick and bubbly. Pour into your favorite dessert glass and chill throughly. Microwave at HIGH (100%) 7 to 10 minutes or until mixture comes to full boil, stirring every few minutes. Stir in butter and vanilla. Pour into dishes to cool.